A large number of people across the world are unable to feed themselves because of mobility issues and amputation, and, for the most part, have to depend on a caretaker to get fed. 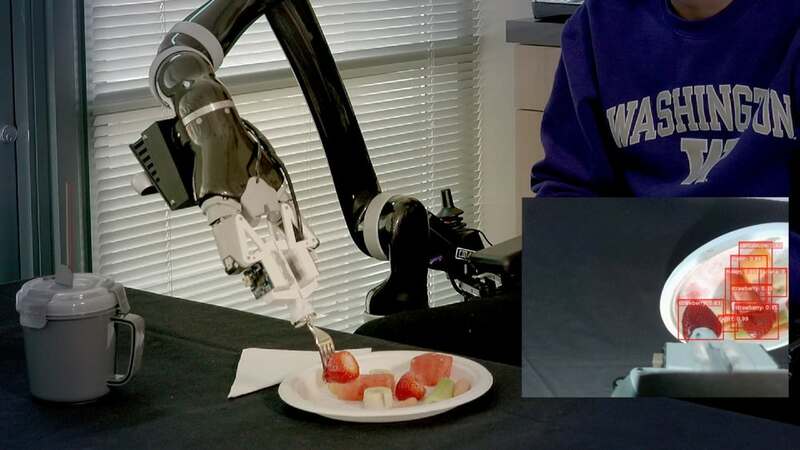 Thanks to some researchers at Washington University, a robotic arm may be coming into their lives to change the way they are fed. ADA (Assistive Dexterous Arm) is a robotic arm that can be attached to a motorized wheelchair. One specialty of ADA is that it can feed a person with mobility issues without having to depend on someone else. Once activated, the first thing ADA does is pick up a custom, 3D printed fork docked on the side of the wheelchair. Next, thanks to a couple of special algorithms built for it, ADA’s camera scans the plate and tells the arm how to pick it. 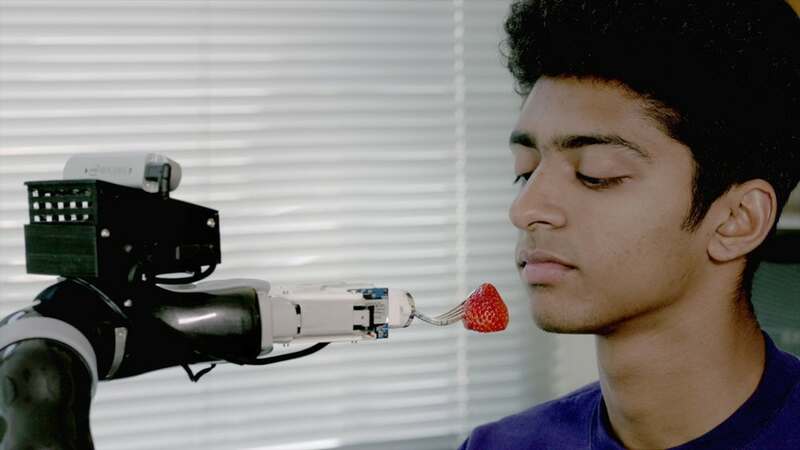 Once the food is picked, the arm moves and rotates, and brings the food close the user’s mouth so they can bite it. Eating food with a fork seems like a very trivial task to humans but for a robot, it is perhaps one of the most difficult things it may have to deal with! Humans naturally adapt their approach to accommodate shape and size of food items they are dealing with, however, a robot needs to understand the size, type, and texture of foods they are dealing with. For example, if ADA is picking up a slice of banana, it may have to prick it with its fork at an angle so that the banana doesn’t just slide off the fork. Similarly, to pick a long piece of celery or baby carrot may require have to be first, pricked at an end and not the middle, and second, placed in front of the user’s mouth in such a way that it’s easy for them to bite it. 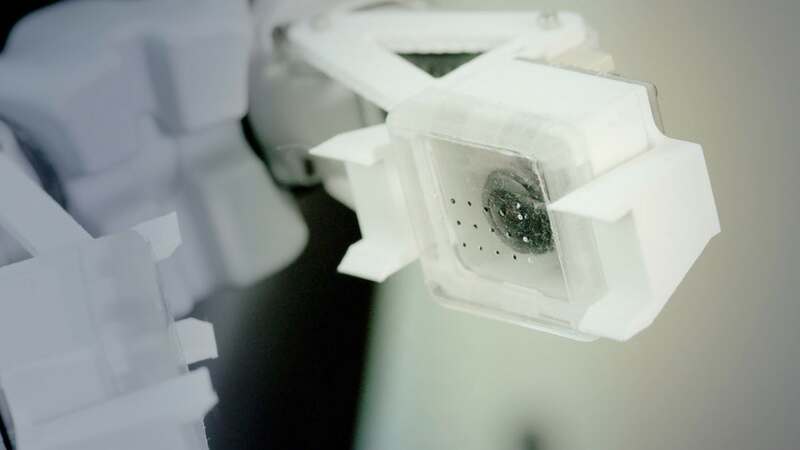 Several factors are in play here – shape, size, texture, hardness – that determine how it should be dealt with by the robot. Some questions that need to be answered in such scenarios are how much force should be applied to pick up food without dropping it? How should the fork be rotated? Do some foods require more force than others to be gripped perfectly? ADA seems to answer all these questions very well. Thanks to its arm mounted camera, ADA can also adjust to head movement of the user. If the plate is empty or the user indicates they’ve eaten enough, ADA moves the arm away and puts the fork back into its dock. The video below shows a great demonstration of how ADA works, and how much effort and thought has gone into its design.